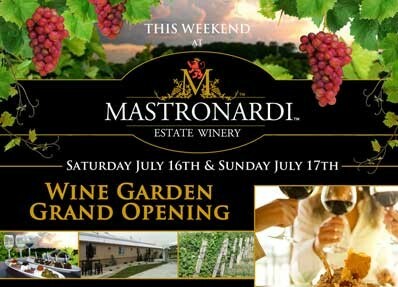 Celebrate the opening of Mastronardi Estate Winery‘s new Wine Garden on Saturday, July 16, 2011. Indulge in a glass of wine as you tour their lush vineyards and cool off under their shade tents amongst the garden. There will also be live entertainment to enjoy by Dawn Cott and Elvis Gori. Sample a flight of 6 award winning wines paired perfectly with a preselected assortment of tapas prepared fresh on site from Chef Aaron Moon for only $15. Sangria by the pitcher available all weekend for only $14.50. While you’re there you just may bump into WindsorEats as our Wine Trail Ride group (sorry, the ride is sold out!) will come rolling in sometime around 4:00pm. It’ll be a great site to see as over 50 cyclists come riding in.